On April 1, 1954, 941 boys marched from the Bish National School, Nuns’ Island, and from the Old Mon in Market Street to their ultra-modern bright new school, St Patrick’s, which was situated at the corner of Lombard Street and Bridge Street. The new school was built on a site which had been the location of the Shambles Barracks, which was occupied by the British army for many years up until 1909. It was then bought by Fr Dooley, the parish priest of St Patrick’s, for £1,200. It functioned as a tenement for a number of years and eventually became derelict. For a while some locals used to play a form of pitch and putt in the grounds. Bishop Michael Browne considered the site as a location for his proposed cathedral. Construction work on the new school commenced in 1952 and on March 31, 1954, the minister for education, Seán Moylan, officially opened it. The following day, the pupils arrived. From the outset, there was always an emphasis on music in St Pat’s. 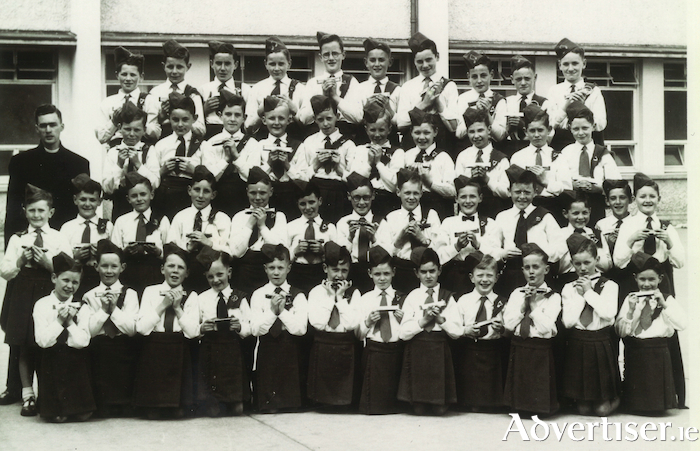 This was the harmonica band taken outside the school during An Tóstal in 1957. They are, back row: Jimmy O’Flynn, Brendan Reid, Seamus Kelly, Kenneth Garvey, John Melia, Michael Conneely, Joe O’Brien, Pat Conneely, Murt Folan, Michael Cunningham. Third row: Tommy Deacy, Jimmy Greally, Gerard Fleming, Seán Walsh, Pat McCarthy, Noel Walsh, Kevin Silke, Jim Conneely, Michael Kavanagh, Paul Curry. Second row: Brendan Divilly, Francis Cunningham, Jackie Small, Pádraic Mullen, John Forde, Seán O’Toole, Tony Farrell, Éamonn Ryan, Des Whelan, Pat Barrett, Roger Greally, C Fullard, M O’Toole. Front row: Francis Kavanagh, Michael Brennan, Michael Greaney, Michael Conroy, Pat Irwin, Michael Kearney, Martin Curry, Eamonn Joyce, Pat Heaney, Francis Tierney, Frank O’Flynn, and Tommy Rea. This band was eventually replaced by the school brass band. If you ever attended school in St Pat’s since its inception, you are invited to an informal past pupils’ get together in the school at 8pm on Friday of next week, June 15, at 8pm. This will give you a chance to meet old friends, revive memories, go through old roll books, see some issues of Pat’s Chat, revisit old classrooms, study old class and team photographs, see new technology used in the classrooms, and hear about major future plans for the school. Refreshments will be served. It has the makings of a great evening so if you are a Pat’s man, don’t miss it, and bring along any memorabilia you might have of the school.